'Gabbar ke taap se tumhe ek hi aadmi bacha sakta hai, ek hi aadmi ... khud Gabbar' ! Is there anyone who is not familiar with this dialogue or the legendary movie 'Sholay'? Sholay, the path breaking Bollywood movie directed by Ramesh Sippy , which has a cult following in the Indian film fraternity was shot here at Ramanagara , a town which is 50 km away from Bangalore in the Bangalore- Mysore highway. Ramnagara or Ramgad as picturised in Sholay is a paradise for trekking and photography. The Ramdevarabatta hills also provided location for David Lean's "A Passage to India". Who doesn't dream of a exquisite bike trip on a sunday morning through rustic villages and splendid granite hills? The entire landscape is filled with rugged hills and valleys and it is an extremely popular adventure spot near Bangalore. Strewn with rocks and boulders.., Ramanagara has a rugged terrain that is ideal for trekking. When talking about the best trekking locations around Bangalore, it is unimaginable to disdain Ramanagara. Ramanagara is situated in the banks of river Arkavathi. The stretch of fawn land with granite outcrops looming is a sight to behold and serves as a perfect trekking backdrop. The trek on the granite slopes which are around a 50 degree gradient isn't really a tough task unless you are a first-timer. 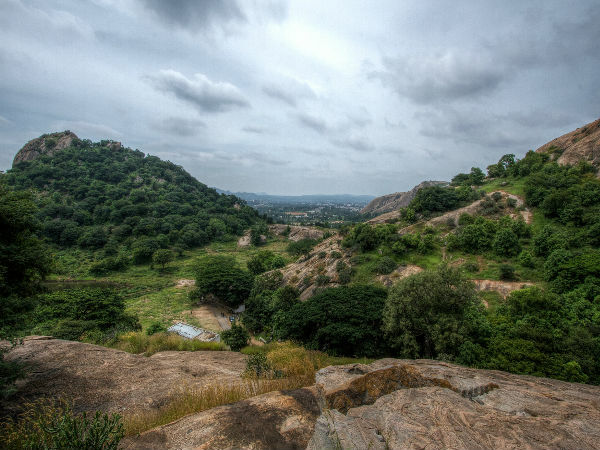 A landscape covered with rocks and granite hills, Ramanagara has sparse vegetation. It is also home to some highly endangered species of birds such as the Long Billed Vulture and Yellow Throated Bulbul. Ramdevarabetta Hill is the most famous hill at Ramanagara. At 3066 feet above sea level, it is known for it's mystical shape. The amazing view of the surrounding areas from the peak of these hills is a sight to behold. Once you reach the top , you get a spectacular bird eye view of Bangalore! This is the hills where Gabbar Singh used to sit with his men Samba and Kaalia. A ride from Ramanagara to Manchinabele dam could be a revitalizing option. The rustic road takes you through countryside villages and granite hills. The dam and the vicinity are simply picturesque. A weekend ride to Ramanagara and the Ramdevarabetta hills is highly recommended. A reviving ride to this place is something you really deserve!